Abbaye de Senanque — 12th century Cistercian abbey near Gordes open to visitors. Honey, lavender essence, and liqueurs are available for purchase. 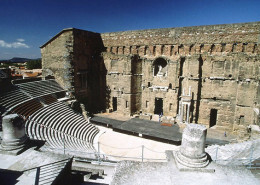 Roman Theatre & Triumphal Arch at Orange — one of the best preserved theatres of the Roman Empire (circa 27-25 B.C.) built during the reign of Augustus. See UNESCO.org for more information. 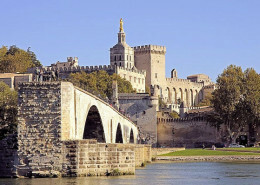 Avignon is well known for its ramparts, its famous Pont Saint-Bénezet and the Palais des Papes. 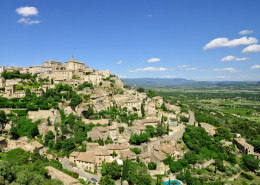 Gordes—the immensely popular hilltop village is crowned by the church of St. Firmin and a Renaissance château. Isle sur la Sorgue—this medieval town, built on the islands of five branches of the Sorgue river, is known for its waterwheels and antiquities markets. Pernes-les-Fontaines—a medieval fortified town, with walls dating back to the 16th century. As the name suggests this is a village with many ancient fountains; there is a walking tour that passes most of the almost forty charming fountains. 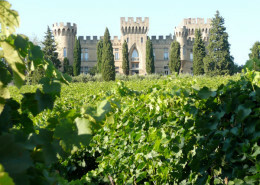 Châteauneuf-du-Pape— the well-know appellation of the Côte-du-Rhône region. 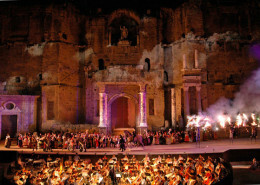 Les Choregies d’Orange— a festival of opera, drama and ballet takes place in the Roman Theatre in Orange. Festival d’Avignon — an annual performing arts festival is held in Avignon in the month of July. 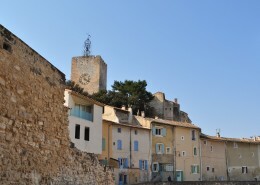 Vaison-la-Romaine Dance Festival — Companies from all over the world come to perform at the dance festival, staged in the town’s atmospheric Roman Théàtre Antique. 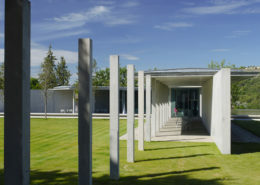 The programme ranges from ballet to jazz to flamenco. Festival d’Aix — an annual international music festival which takes place each summer in Aix-en-Provence, principally in the month of July. 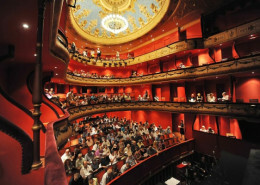 Devoted mainly to opera, it also includes concerts of orchestral, chamber, vocal and solo instrumental music. 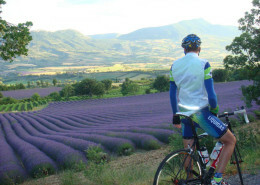 Biking in Provence—cycling is big in the Luberon, whether on the road or off-road. 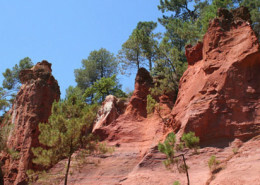 Le Luberon— Luberon Regional Nature Park offers walking trails, hiking, cycling, horseback riding, farmers markets, Geological Nature Reserve and Historical Museum of the Pays d’Aigues. 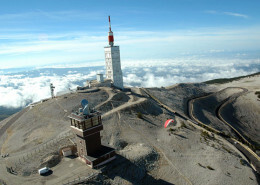 Mont Ventoux— a hikers and serious cyclists paradise. Climbing near Apt—at Buoux, the south-facing cliffs along the right bank of the Aiguebrun river are an excellent, and popular, location for climbing. Climbing near Avignon in Provence—The area to the north east of Avignon there are over 50 different crags offering good quality sport climbing. These crags are generally relatively small and spread out, which means they are usually quiet and peaceful places to rock climb, and are in stunning locations. Canoe & Kayak — The Famous river Sorgue runs from the exurgence of Fontaine de Vaucluse. Antiques— Over the past thirty years, Isle-sur-la-Sorgue has become the capital of antiques, with many antique dealer groupings in the town. 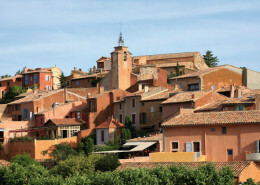 There are many galleries and shops, and a large provençal and flea market every Sunday. Bories — stone huts built by animal herders as far back at the 13th century. Marlene Boyer — offers private chauffeured excursions and a “change of pace” tour alternative, designed to suit every walk of life. Marlene is an english-speaking tour guide and native of Provence. 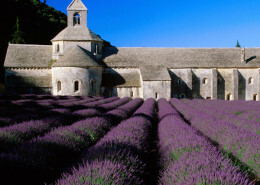 You will see and taste the best Provence has to offer with an emphasis on Cultural Tourism, Entertainment, & Gastronomy. 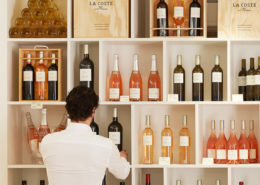 Provence Tours as You Wish (Ventoux Découvertes) — offers private driving tours in an air-conditioned minibus, the itinerary is customizable to fit your needs and interests. Visit their site to see some possibilities.